Collin (Daveed Diggs) and Miles (Rafael Casal), who are black and white, respectively, have been best friends since they were kids. Now in their 20s, they both still live in the rough Oakland neighborhood where they grew up, although it‘s been gentrifying in recent years. The change in the neighborhood has made it hard for the two of them to get along with their new neighbors because Collin is a convicted felon on probation, and Miles has ghetto written all over him, such as the tattoos all over his body. When Collin was paroled, Miles got him a job with the moving company where he works. After hours, Miles goes home to his baby’s mama (Jasmine Cephas Jones) and young son (Ziggy Baitinger), although he’d rather roam the streets with his gun. Collin, however, has a strict curfew and needs to stay out of trouble becuse he’s finishing his parole and sentence at a local halfway house. The plot thickens one evening when Collin is in his car at a stoplight. He is the sole witness who sees a white police officer (Ethan Embry) shoot an unarmed black man in the back. Collin drives away from the scene when ordered to by the police, but the incident haunts him for days. Surprisingly, when he tries to talk about it with Miles, racial tensions surface that test their close relationship. 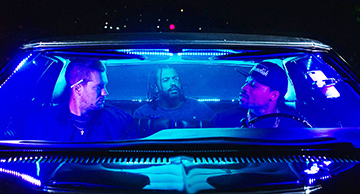 Blindspotting is an in-your-face dramatic comedy co-written by co-stars Daveed Diggs and Rafael Casal who worked on the script for over a decade. The movie also marks the directorial debut of Carlos Lopez Estrada, who previously shot music videos. Blindspotting’s exploration of race, class, and police brutality issues creates a thought-provoking experience that will affect you even after you leave the theater. Excellent (****). Rated R for sexual references, drug use, brutal violence, ethnic slurs, and pervasive profanity. Running time: 95 minutes. Production Studios: Summit Entertainment/Codeblack Films/Foley Walkers Studio/Snoot Entertainment. Distributor: Lionsgate Entertainment.